The Supreme Court heard oral argument in two cases on Tuesday. I’m predicting the winners of the Supreme Court cases based on the number of questions asked during oral argument. Studies have shown that the advocate who receives more questions during oral argument is more likely to lose. For more about this method, see my post on last Term’s Aereo case. Kansas v. Nebraska and Colorado asks what relief is appropriate to remedy the violation by Nebraska of a compact apportioning the waters of the Republican River between Kansas, Nebraska, and Colorado. The Court has original jurisdiction over the case involving three states and will review the special master’s report and award of remedies. This is an unusual case involving the Court exercising original jurisdiction. It’s a tough case to call simply based on the question count. 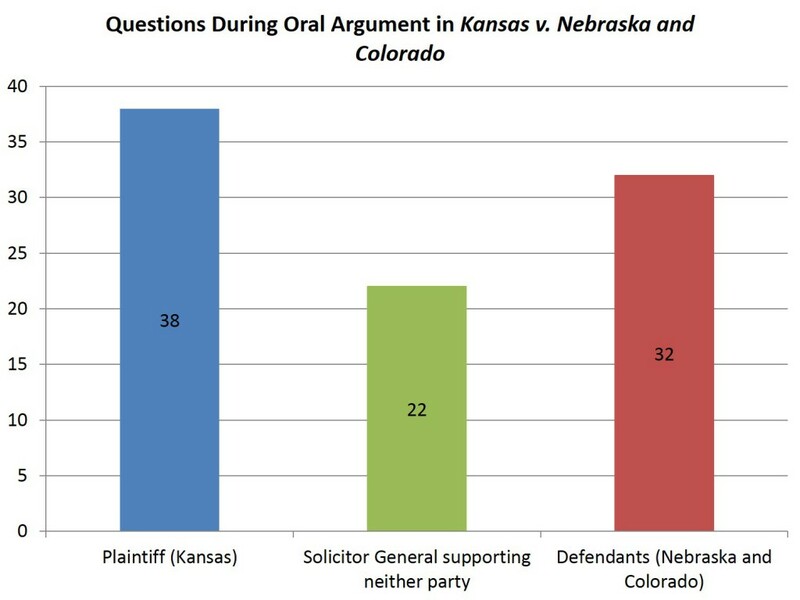 Plaintiff Kansas received a few more questions (38) than Defendants Nebraska and Colorado (32), which suggests that the Kansas will lose in its attempt to convince the Court that injunctive relief is warranted, as well as more significant disgorgement. However, the Defendants’ position may not necessary prevail, either. In prior cases, the Court has tended to side with the Solicitor General’s position. In this case, the SG supported the special master’s report and issuance of partial disgorgement, but no injunctive relief. The SG’s attorney received 22 questions, although it’s not clear how much time was allotted. Based on both the question count and the Supreme Court’s tendency of adopting the SG’s position in prior cases, my prediction in this case is that the Supreme Court will follow the SG’s position. The second case, North Carolina Board of Dental Examiners v. Federal Trade Commission, asks whether, for purposes of the state-action exemption from federal antitrust law, an official state regulatory board created by state law may properly be treated as a “private” actor simply because, pursuant to state law, a majority of the board’s members are also market participants who are elected to their official positions by other market participants. My prediction is that the Court will side with Respondent FTC’s position (i.e., that the Fourth Circuit correctly upheld the FTC’s determination that the state-action doctrine did not exempt the Petitioner’s conduct from federal antitrust scrutiny). 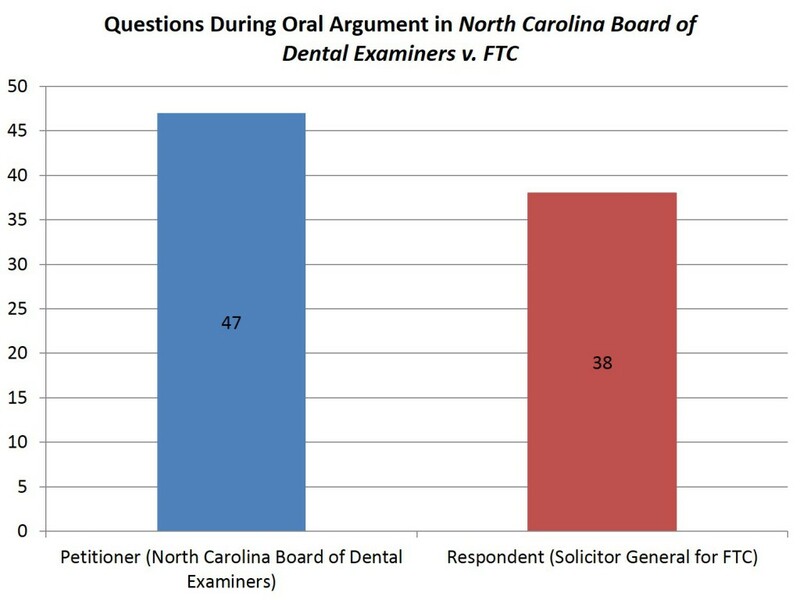 The Petitioner North Carolina Board of Dental Examiners received nine more questions than the Respondent FTC, which suggests a win for the FTC.